Forechecking: No Jamie Oleksiak? No Problem! Your Dallas Stars Ushered In The Post-Jamie Oleksiak Era By Ringing Up Five Points In Three Games. Not Too Shabby! Now that your Dallas Stars are now living a post-Jamie Oleksiak era, having traded the “Big Rig” to the Penguins for a fourth round draft pick, how has the team responded? Marvelously! Conspiracy theorists will say that coach Ken Hitchcock and company played Oleksiak over Honka during the first quarter of the season to raise his trade value while young Julius learned not to pout about ice time. But one thing is for certain: The season continues to roll along here in Forechecking either way. Here’s what happened last week and is coming up this week in Your Dallas Stars. • Loser Point vs. Washington Capitals, 3-4 (OT). A tepid start between unfamiliar foes quickly gave way to an aggressive first period after the Caps lit the lamp first. Antoine Roussel bumped a fresh-off-IR TJ Oshie post whistle and the fur started flying. Two fights later and 20 minutes in the books and both squads head to the locker room tied at one goal apiece. The next 40 minutes were high flying, entertaining, Grade A+ hockey with the Russians leading the way. Capitals defensman Dmitry Orlov scored on a beautiful deke past the Stars defense and roofed it over a windmilling Ben Bishop. Not to be outdone by his fellow countryman, Alexander Radulov then blasted a one-timer on the fly to give the Stars the lead with four minutes to go, all while celebrating with an exaggerated stick twirl in front of Alex Ovechkin. The celebration was short-lived, however, as the Capitals immediately responded with a goal of their own to send the contest to overtime, where Andre Burkovsky scored his second of the night to put a sour ending to such a sweet game. Darn it. • Victory Green™ vs. Chicago Blackhawks, 4-0. 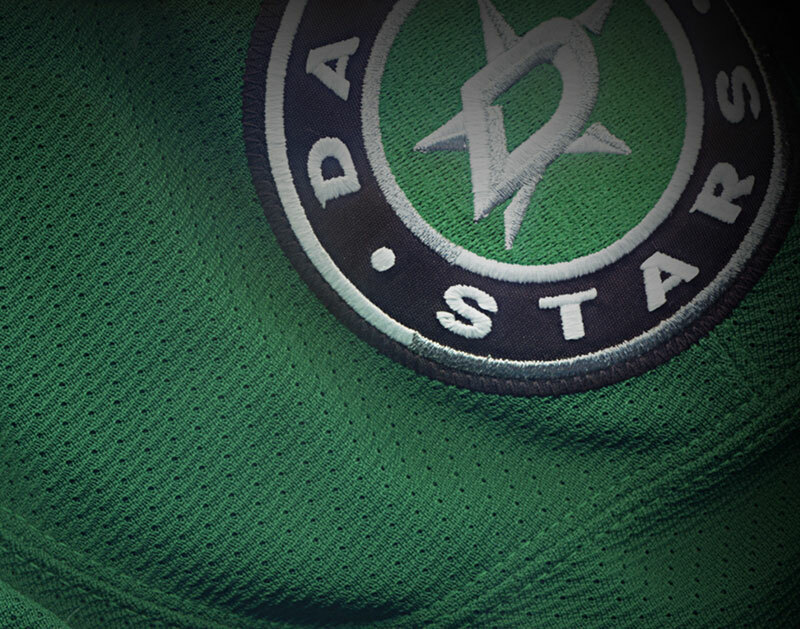 Chicago and their bandwagoners waltzed into the AAC with a five-game winning streak on the line, but schlepped their way home back to Chicago and Frisco losing their third in a row to Your Dallas Stars. Jamie Benn netted the game’s first, an improbable game-winner late in the opening frame off the dogged pursuit and work of Remi Ellie, who managed to find the captain wide open for an easy tap-in. Tyler Seguin also finally got on the scoresheet, potting two goals to break an eight-game goal drought and tie Jamie Benn for team lead with 15. The Stars dominated play through 40 minutes and were content to allow Chicago to put shots on goal and focus on cleaning up rebounds off of Bishop as he shut things down and picked up the shutout. With the Victory Green™, coach Ken Hitchcock earned his 800th win as a head coach in the NHL, good for third-highest in NHL history. Impressive, eh? Fun fact: The Blackhawks have led your Dallas Stars for exactly 0:00 through three games this season. How about that!?!? • Victory Green™ vs. Nashville Predators 4-3 (Shootout). Your Dallas Stars haven’t matched up so well against last season’s Western Conference Champions this season, so to play competitively on Todd Harvey night was a welcome treat for fans at the AAC. Dallas fell behind early, surrendering the first goal of the game on Nashville’s first shot just 34 seconds into the game and taking a two-goal deficit into first intermission on a shortie-handed tally. Undeterred, the Stars made good in the second, tying the game on Roussel and Hanzal efforts. In overtime, Dallas committed two penalties — Benn for tripping at 1:05 and Hamhuis for cross checking at 2:34 — but were able kill the disadvantage in large part thanks to Bishop and the team’s winning four out of five faceoffs. Cue the shootout, where Radulov and Seguin made hay to secure two much-needed points against an awfully good division rival. 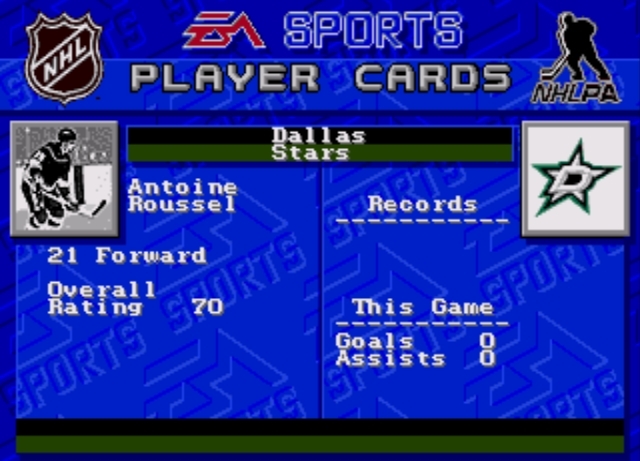 NHL ’94 Player of the Week. What a week for our favorite frenchman on and off the ice. Antoine’s fingerprints were all over the Washington game, in which he notched two huge goals against Chicago and Nashville and made the most of his limited ice time in a more limited role. His CF percentage of 55.3 is the highest of his career as he continues to draw the ire of the opposition. All this, while recovering from the flu and upper body injuries? That’s an impressive feat! Oh, and he also welcomed his second child to the world this week. Congrats, Rooster! Dallas Stars at Minnesota Wild. Wednesday, December 27, at 7 p.m. The Wild are starting to come alive in the Central Division after a lackluster start to the season. Friday, December 29, at 7:30 p.m.
St Louis has dipped a bit in the standings but remains every bit as difficult to handle. Dallas Stars vs San Jose Sharks. Sunday, December 31, at 7 p.m. Your Dallas Stars’ annual New Year’s Eve tradition continues with the Sharks tornado-ing their way to the AAC. This year, San Jose has had difficulty scoring, and opponents have difficulty scoring against them. Not what you’d expect from the boys in teal! Previous ArticleThings To Do In Dallas On Tuesday, December 26. Next ArticleThings To Do In Dallas On Wednesday, December 27.